Come to Virtuality and experience the most cutting edge VR technology that will give you an incredible and memorable experience that is both reasonably priced and conveniently located! 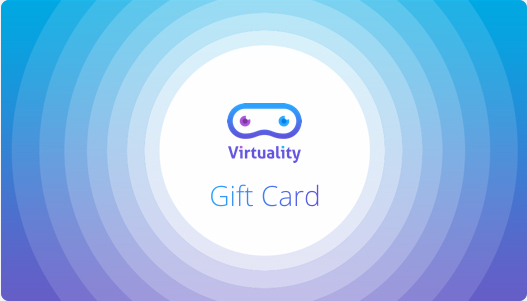 Virtuality gift card is perfect for the Holidays and makes a unique and memorable gift. It can be used in any of our locations. Buy yours today and your loved ones will thank you later! Book your next event with Virtuality! We will include everything needed for an unforgettable event which includes a Virtuality Technician in every event package! Perfect for birthday parties, corporate events, fundraisers and many more events! We are currently hiring in multiple locations! Sign-up and join our Virtuality Loyalty Program! Receive exclusive promotional offers and discounts! It's free! So sign-up and start enjoying exclusive membership benefits! ©2016 Virtuality, Inc. All Rights Reserved.